Michael had the privilege on Sunday to perform close-up magic for the stars of Dancing on Ice last weekend at the grand finale after-show party. 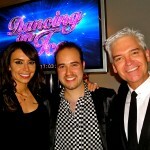 He’s seen here with the show’s presenters, Phillip Schofield and Christine Bleakley. Check out the Gallery page for more photos!